The world is watching a piece of history being destroyed before our eyes. When news agencies began reporting that the Notre Dame cathedral had caught fire, the world held its breath. Throughout the day, we watched footage of flames enveloping the iconic structure, its grand spire collapsing, firefighters seemingly unable to control the inferno. Whether the structure could be rescued from total destruction has been unknown, though it appears now that the base structure has been saved. As Dan Rather wrote on Twitter, "Why has the burning of Notre Dame moved so many? Because we believe in beauty, majesty, faith, art, history, and the human expressions thereof. We recognize in this cathedral our common humanity. A scar now emerges in our connections to our past, our future, and each other." It's only 37 seconds long, but a video has captured the helplessness we all feel witnessing this tragic event. 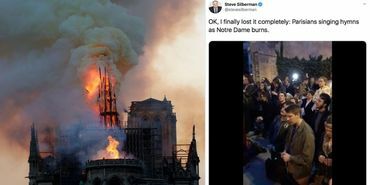 Author Steve Silberman shared a video captured by Ignacio Gil, a correspondent living in France, and it's enough to bring a tear to even the hardest of hearts. It shows a group of Parisians singing hymns in French as they watch the 800-year-old Notre Dame cathedral burning in the distance, and it is tragically beautiful. When there's nothing you can do but watch something beautiful burn, you stand in solidarity and sing. It's what humans do and have always done. Hearts all over the world are with you, Paris. Vive la Notre Dame. I felt like crying. Such a loss. So tragic. Was heartbreaking to watch it happening yesterday. I would of been out there standing with them if I was there in Paris.I pray that they can rebuild quickly like their leader is hoping for. Thank you for sharing this, Robert. I was relieved and surprised to read that the Rose Windows survived the fire. Notre Dame is just across the Seine from the hotel where my hubby and I stayed in Paris years ago. It was wonderful to visit the Cathedral and to hear the carillon every morning from our room. I hope this beautiful place can be restored in a way that is both historically authentic in appearance and much more fireproof..